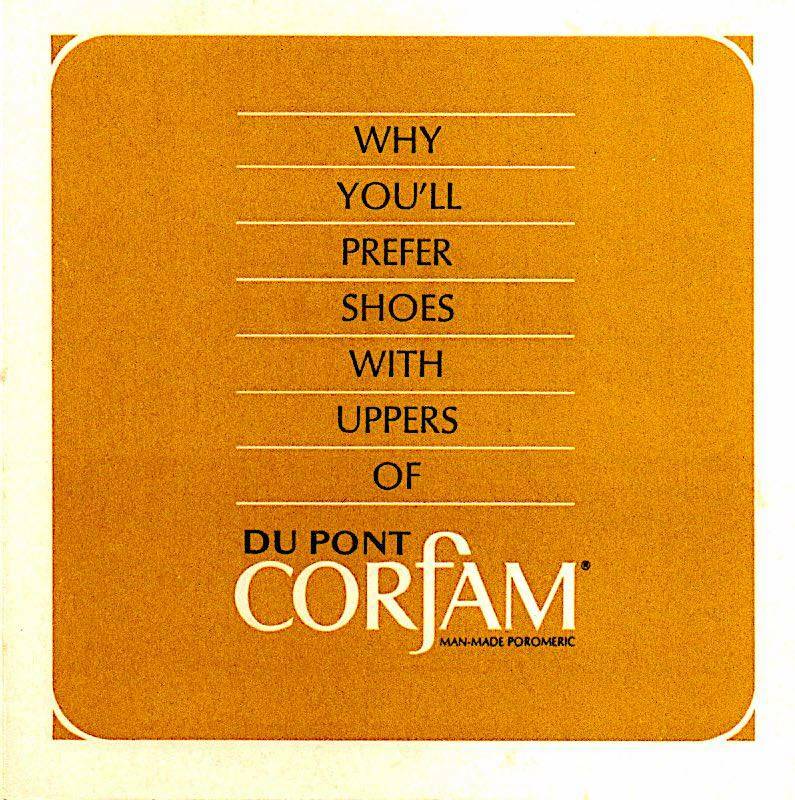 Corfam, DuPont’s man-made ‘poromeric’ leather, was introduced at the 1963 Chicago Shoe Fair with great fanfare and was their centerpiece product at their 1964 New York World’s Fair pavilion. DuPont cracked the ‘breathability’ problem as Corfam was a microporous polymer. It could be made in any finish but really ‘shined’ as a man-made patent leather. DuPont’s talk card lists Corfam’s numerous other benefits. 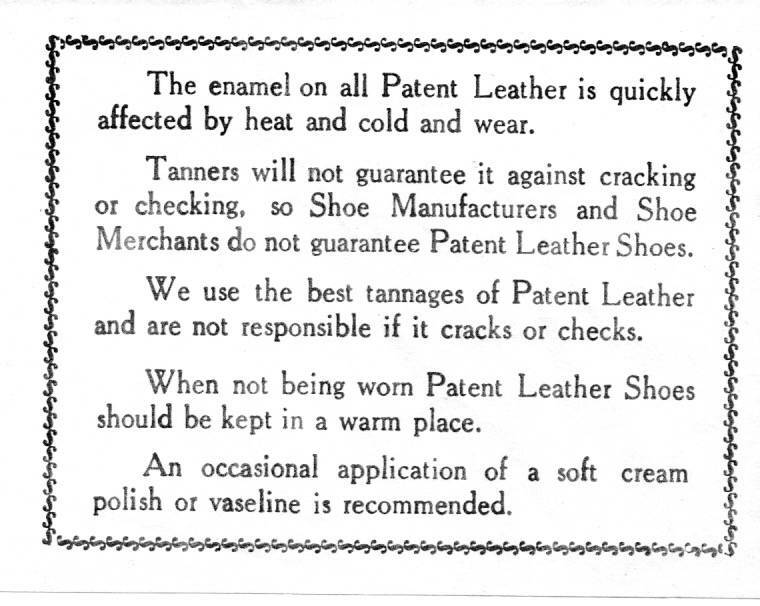 Corfam's early success as a substitute for patent leather was so strong that DuPont trade marked the name “Pattina” when Corfam was produced as a man-made patent leather. In fact, to this day many service and military shoes which require a perfect hi-gloss patent shine are still made from DuPont Pattina Corfam. To give you an idea of just how revolutionary Corfam and Pattina were in the 1960s, here is a talk card from a high-end pair of vintage shoes that used genuine patent leather. Unfortunately for DuPont, leather prices continued to drop through the 1960s. 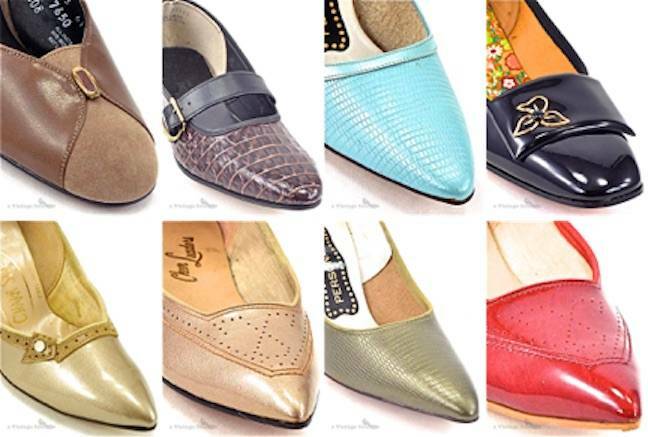 Despite the many benefits of Corfam, shoe manufacturers opted for the less expensive genuine leathers. DuPont sold their Corfam operation in 1971 to pursue other areas of applied chemistry. With the many environmental regulations that began in the early 1970s, the U.S. leather market began to shrink in the late 70s as tanners either closed their doors or moved operations overseas. Evolving environmental laws and continuing manufacturing innovations created the man-made leathers that have become such an integral part of our modern society. Today you can find man-made leather marketed under a variety of names including ‘pleather,’ ‘PU leather,’ ‘leatherette,’ ‘Naugahyde,’ ‘Alcantara,’ and ‘Ultrasuede’ to name but a few. Just remember, for shoes it all started with Corfam. Click ‘Material’ and select ‘man-made’ to find your special pair of authentic – unworn – vintage shoes made with genuine Corfam from our hundreds of examples.